What are Medial Branch Blocks? The medial branch block (MBB) is an effective and direct way of treating pain originating from the facet joint of the spine. Research indicates this may account for up to 45% of back and neck pain reported by patients. 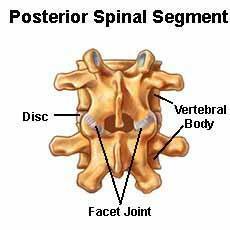 The facet joint is a connection joining an individual bone of the spine (i.e. one vertebra) to another. They are important in controlling spinal movement and integrity of the spine. Facet joints can be a source of back or neck pain, however, mainly as a result of injury or trauma. Arthritis, in which the joints or the protective synovial fluid around them wears down, can also occur in facet joints. This can occur either with age or as the result of an autoimmune condition. Facet joint arthritis is also a source of pain and irritation in the spine. It is also possible that poor posture or abnormal spinal curvature may contribute to this type of back pain. How is a Medial Branch Block Performed? Direct injections are an effective method for treating pain in facet joints. These deliver long-lasting steroids, such as dexamethasome. 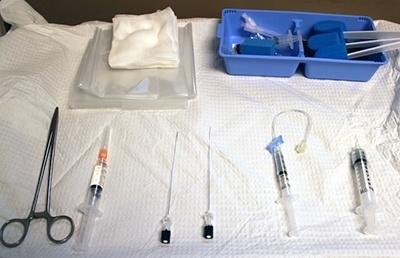 In some cases a local anesthetic such as lidocaine, bupivacaine, or mepivacaine will also be injected. The joints themselves can be injected. This results in long-lasting relief from the associated pain. The medial branch block (MBB) is an even more specific method of controlling this, as it involves targeting the nerves that provide sensory signals to the facet joint (i.e. the medial branch) itself. 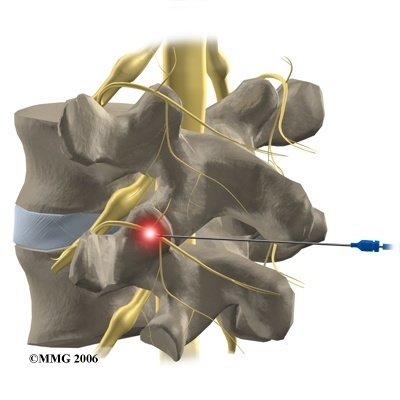 A needle is placed directly into the nerve and delivers the compounds to relieve the facet joint pain more directly. Medial branch blocks have been found to be an appropriate and safe option for back and neck pain. The procedure has the advantage of being non-invasive and an alternative to surgery. The main risks of this procedure are associated with technical errors and issues, particularly the misplacement of the needle. 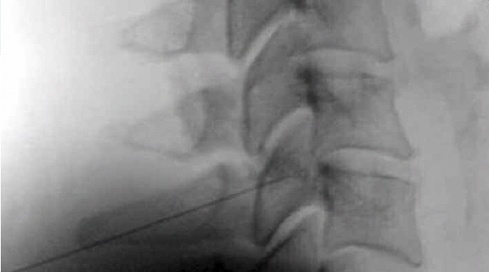 A small number (approximately 3%) of medial branch blocks in the neck or upper back result in inadvertent injection into a blood vessel instead of the nerve. Watch A Medial Branch Block – Performed Live! This can be avoided by the use of techniques such as fluoroscopy or ultrasound to guide the needle to the precise location to be injected. The accuracy of this combination is approximately 90%. Other potential risks of medial branch blocks include infection, bleeding, and nerve damage. Some of the potential side effects related to the steroids injected include elevated blood sugar, weight gain, and, ironically, arthritis. They can also cause stomach ulceration and reduction of the immune response. The local anesthetics used may cause desensitization of the nerve over time and interactions with other medications taken by the patient. In isolated cases (no more than 2% of patients receiving medial branch blocks), temporary neurological complications associated with local anesthetics, such as chest discomfort and nausea, occur. Consultation with a physician, who will assess the likelihood of complications, is advised before undergoing a medial branch block. Facet joint disease or damage is implicated in neck, upper back, and lower back pain, originating from joints in the cervical, thoracic, and lumbar vertebrae respectively. They can be injected separately to treat the pain in each relevant condition. Cervical medial branch blocks have a low incidence of side-effects and provide moderate short-term relief from neck pain. Thoracic medial branch blocks can control upper- and mid-back pain. They have been reported to restore at least 50% normal functions in over 80% of patients, over a period of two years. Lumbar medial branch blocks control lower back pain, and can restore at least 40% normal function with a decrease of approximately 50% in pain experienced. Cervical, lumbar, and thoracic medial branch blocks are also useful in diagnosing the cause of spinal problems, i.e. in evaluating the possibility of facet joint arthritis or damage as the source of pain. Medial branch blocks are effective in controlling the pain associated with facet joint arthritis and back pain. The anesthetic injected relieves pain while the steroid acts to reduce the inflammation and irritation associated with arthritis or joint damage. The treatment is used to control pain originating from facet joints in the vertebrae of the neck and upper and lower back. It is also employed in diagnosing the cause of pain in these areas. Medial branch blocks provide pain relief in the short to medium term and restore a significant degree of function and normal daily activities to patients receiving this treatment. Lee HI, Park YS, Cho TG, Park SW, Kwon JT, Kim YB. Transient adverse neurologic effects of spinal pain blocks. Journal of Korean Neurosurgical Society. 2012;52(3):228-233. Verrills P, Mitchell B, Vivian D, Nowesenitz G, Lovell B, Sinclair C. The incidence of intravascular penetration in medial branch blocks: cervical, thoracic, and lumbar spines. Spine. 2008;33(6):E174-177. Kim D, Choi D, Kim C, Kim J, Choi Y. Transverse process and needles of medial branch block to facet joint as landmarks for ultrasound-guided selective nerve root block. Clinics in orthopedic surgery. 2013;5(1):44-48. Riew KD, Park JB, Cho YS, et al. Nerve root blocks in the treatment of lumbar radicular pain. A minimum five-year follow-up. The Journal of bone and joint surgery. American volume. 2006;88(8):1722-1725. Manchikanti L, Singh V, Falco FJ, Cash KA, Pampati V, Fellows B. The role of thoracic medial branch blocks in managing chronic mid and upper back pain: a randomized, double-blind, active-control trial with a 2-year followup. Anesthesiology research and practice. 2012;2012:585806.